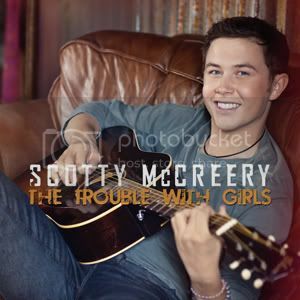 Review: Scotty McCreery - "The Trouble With Girls"
The pressure is on for Scotty McCreery with his new single "The Trouble With Girls," the second from his October 4 album Clear As Day. "The Trouble With Girls" premiered on WQDR-FM in Raleigh, N.C., McCreery's hometown country radio station and will soon be heading to digital outlets like iTunes and Amazon. "The Trouble With Girls" comes at a critical time for McCreery. His American Idol single "I Love You This Big" did well at iTunes and the video hit #1 at CMT. He has huge momentum with his fan base, who continue to buy his American Idol EP from iTunes, heading towards the release of his debut album. This is his chance to prove to them, the critics, and the casual listeners his album will be more than one big song and some filler. This is his chance to establish himself as a credible solo artist. In addition to the pressure to win audiences over, he's also got to do battle with his Season 10 runner-up Lauren Alaina, who releases her album a week after Scotty. Not only that, Season 1 champion and established pop superstar Kelly Clarkson is releasing her fifth album Stronger later that month. There's going to be a lot of competition at radio and for those American Idol dollars. Now that we've raised the stakes and given this poor kid an ulcer, let's talk about his new song "The Trouble With Girls." The first thig I noticed about the song is the title; it's the name of an Elvis Presley movie and all Scotty's fans know Elvis is his hero. The second thing I noticed was that the more I listened to it, the more it felt like I was listening to two different songs in one. Trouble” was penned by Chris Tompkins (Carrie Underwood's “Before He Cheats”) and Philip White (Rascal Flatts's “I'm Movin' On”). I don't know if the songwriters couldn't get it together or if decisions by the producer(s) kept this from meshing but there are two vibes going on in this tune and one is much better suited for Scotty than the other. Just what them girls are all about"
Is nobody loves trouble as much as me." I'm loving this to this point and think he is really about to knock this one out of the park when someone made a horrible decision, turning this simple song about young love into an anthem. The song swells with a huge string arrangement and Scotty gets swallowed up in his own song. It was completely unnecessary! The song was working fine but now it's trying too hard to be something it's not, asking Scotty to be someone he's not. I don't know if that muddled, messy second half made the song feel too long for me but it gave me just a bit of apprehension about Clear As Day. I'm still excited for the record and really want to like it but I'm afraid more songs will fall into this "Trouble With Girls" trap. I'm also looking for a little variety after two songs about girls and love. I'm ready for something upbeat, hoping Scotty will get into a little bit of real trouble. Maybe that will come in the form of a song song written by Keith Urban currently slated for the record. We're still waiting for a full tracklisting for the record. In the meantime, we'll call "The Trouble With Girls" a triple with an attempt to steal home. He comes awfully close to making me start the wave but instead I stayed seated with a goofy grin on my face.